You know you’re reading a Diana Gabaldon novel when you start making comments to yourself like “Only 400 pages to go.” And if you start putting the words “Oh, good!” side by side with the first statement, you know you’re reading this particular Diana Gabaldon novel. A couple of weeks ago, I was reading this book on a plane. I think I was about 500 pages into it and was not impressed. A woman sitting near me got all excited and said, “That’s the greatest series! Aren’t you loving it?” or something of that sort. Now, I don’t normally talk to strangers on planes. But in this case I made an exception because I really wanted to know what had happened to Gabaldon’s sense of plot and structure in the gap between Drums in Autumn and The Fiery Cross. “No,” I said, “it’s the fifth.” And then I went back to reading, happy that my usual assumption that all people on planes – except me – are idiots had been upheld. But seriously. This novel begins with a 271-page segment in which the Fraser family and the many other Highland Scottish families in rural eighteenth-century North Carolina are encamped at an annual event called the Gathering. There is evident political upheaval, as some representatives of the English army arrive to threaten certain individuals (called Regulators) who participated in a recent demonstration against the Crown. Claire Fraser, the novel’s protagonist and a 20th-century surgeon who has traveled in time and now lives in the eighteenth century, completes some medical procedures on a variety of people and animals – and these, as usual, are grisly and fascinating. The extended Fraser family is preparing for two weddings that evening – that of Claire’s daughter Brianna and Roger MacKenzie, who have been “handfast,” or informally married and raising a child together for some time, and that of Jamie Fraser’s elderly aunt Jocasta and Duncan Innes, whose marriage everyone assumes is being made for the sake of securing Jocasta’s considerable fortune under male oversight. These marriages don’t happen at the Gathering, though, because some English authorities arrest the priest for reasons that aren’t clear until later. On top of all this, Jamie Fraser circulates through the Gathering, dispensing avuncular advice and wisdom upon his friends, family, and tenants, making clear his insatiable sexual desire for Claire, and making subtle inquiries into the whereabouts of Stephen Bonnet, who in Drums in Autumn stole Claire’s wedding ring from her twentieth-century husband, Frank, and raped Brianna, possibly conceiving the child that Brianna and Roger are raising as Roger’s. Now, I was content enough when I was reading this lengthy scene, and I always feel a certain sense of coming home when I start a Diana Gabaldon novel – the characters as a whole are very compelling – but I was also very aware that absolutely nothing was happening. Characterization was happening, but after approximately 4,000 pages of this series, spread over the four previous novels, characterization is not especially necessary. I paid close attention to details because I assumed that – as in many novels that rely on suspense – the tiniest details from this opening scene would end up bring important in the plot, but in this case, they weren’t. A few characters from this opening sequence come back later in the novel, and the Regulators become important, and we do find out why the English officials detained the priest, but none of these pieces of information are important enough to justify the length of this scene. The plot of this novel is extremely loose. Jamie does continue to pursue Stephen Bonnet and does eventually find him, and some of the plot threads introduced in the earlier novels in the series – namely that of what happened to the gold that the king of France sent to Scotland in the 1740’s to finance Charles Stuart’s ill-fated attempt to reclaim the British throne – are developed and resolved, but overall this novel consists of characterization, tidbits of information about what it might have been like to live in rural North Carolina in the 1770’s, and not much else. I’ve already said that Gabaldon’s characterization is one of her strengths. Jamie and Claire Fraser are both extremely compelling characters, as is Jamie’s extended family, some of whom return briefly in this novel, and Lord John Grey, who is present in The Fiery Cross only through his letters. I am not much of a fan of Brianna and Roger, however. Bringing them back to the eighteenth century was probably a good move on Gabaldon’s part – since otherwise Jamie would never have met his daughter (Brianna, who was conceived in the 1740’s and then brought back to the twentieth century in utero and raised by Claire and her husband Frank Randall). However, Brianna is largely uninteresting as a character. She is intelligent and determined, but her stubbornness tends to take the form of whining rather than action. Roger, on the other hand, is nebulous as a character, and it seems as if Gabaldon herself really hasn’t gotten her brain around who she wants him to be. At times he is characterized as inept and bumbling; elsewhere his physical strength and grace are emphasized. He quails before Jamie and seems desperate for his father-in-law to like him, yet Gabaldon also takes pains to emphasize the fact that Roger is descended from both the MacKenzies of Leoch and from the “witch” Geillis Duncan (more on her in a moment), and that he is therefore supposed to be crafty and scheming – but we never really see these qualities in his actions. The first two novels in this series – Outlander and Dragonfly in Amber – are narrated in the first person from Claire’s perspective. The third novel, Voyager, is more complicated in terms of point of view because one plot follows Claire back in time for the second time from her life in Boston in 1968 to Edinburgh in the 1760’s, where she reunites with Jamie, while the other plot follows Brianna, who stays behind in 1968 to attend college, but who becomes more and more interested in tracking the relationship between her mother and Jamie Fraser (whom at first she does not believe is her father), leading to her relationship with Roger, who in 1968 was a historian specializing in eighteenth-century Scotland. For that reason, Gabaldon inserts some chapters in that novel that are told in the third person, from a perspective limited to either Brianna or Roger. These chapters were not especially frequent and seemed necessary, and they did not detract from the general feeling that the story as a whole belonged to Claire and Jamie. Drums in Autumn also pursues Brianna and Roger’s budding relationship in the twentieth century and then follows them on their separate journeys back in time and their various adventures as they cross the Atlantic (again, separately) to meet up with Claire and Jamie in North Carolina. Again, these shifts in point of view felt necessary and helpful in that novel. 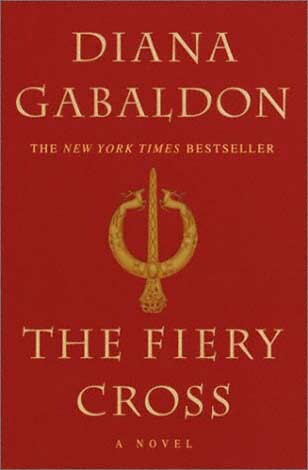 In The Fiery Cross, Gabaldon intersperses Claire’s first person narrative with frequent and, in my opinion, distracting chapters told in the third person from the perspectives of Brianna, Roger, and Jamie. The story as a whole still feels very much like Claire’s, so these interludes seem to me to detract from the narrative as a whole, and they are unnecessary because most of the time all of these characters are together. I tend to assign a lot of weight to point of view in assessing a novel or short story. When selecting a point of view, a writer chooses a set of rules and limitations that she will follow. She can choose any rules she wants, but once she chooses them she needs to follow them. In my opinion, the first person point of view from Claire’s perspective is the right point of view for this novel (though not necessarily for Voyager and Drums in Autumn), and Gabaldon should have done the culling and discerning of details needed to tell the story from Claire’s point of view. There would have been some facts she would have had a hard time working in (and that might have been a good thing), and she would have had to orchestrate some tricks to reveal what some of the secondary characters were thinking and doing, but keeping the novel in the first person would have helped the novel as a whole, in my opinion. Claire’s conflicted loyalties between the eighteenth century (in the person of Jamie, mostly, but also the many other people of that era whom she has come to love) and the twentieth century (represented by Frank, by Brianna, and by Claire’s knowledge of medical procedures of that era and her knowledge of history) is the central conflict of this series, and allowing so much of this novel to be told from the perspective of Brianna, Roger, and even Jamie damages the narrative. For me, most of the suspense in this series comes from Claire’s ongoing questions about how exactly time travel works. In Outlander, she meets a woman named Geillis Duncan, who is executed as a witch. Claire comes close to sharing this fate, and as Jamie rescues her and carries her away, Claire looks back at Geillis and notices that she has a vaccination scar on her arm. When I was reading Outlander, this revelation shot through me like electricity – it was so well timed and well revealed, and I was ready to sit down and read all 10,000 pages of the rest of the series that night (I didn’t do that, of course, but I wanted to). Later, Claire finds out that before she died Geillis arranged to pass a message to Claire that consisted only of the numbers one, nine, six, and eight. Claire assumes that this message means that Geillis traveled back in time from the year 1968, and in the later novels Claire does discover the younger Geillis Duncan, living in twentieth century Scotland under a different name and cultivating her identity as a witch and nascent time traveler. In Voyager, Claire and Jamie meet Geillis again (this time under the name of Mrs. Abernathy) in the Caribbean, where she teaches them a bit more about the secrets of time travel. In the twentieth century, Roger learns through his historical research that he is descended from William Buccleigh MacKenzie, the illegitimate child of Geillis Duncan by Jamie Fraser’s cousin Dougal MacKenzie. Roger later meets William Buccleigh MacKenzie in the eighteenth century, in one of the more compelling plot threads of both Drums in Autumn and The Fiery Cross. This novel, unfortunately, almost abandons the question of how time travel works – and this is probably my second greatest disappointment with it, other than the question of point of view. It is truly only in the final chapter of this novel (this 1,443-page novel! surely the topic could have been introduced sooner, right?) that any new information is revealed about the nature of time travel. This information is interesting, and it does make me want to move quickly along to the next novel in the series, but it should have been introduced much earlier than it was. I will definitely finish reading this series, which consists of two more extant novels and one that is not yet published. It’s not great literature by any means, but it is compelling and intense. Gabaldon has created a world that feels extremely real, in spite of the many, many ways in which she asks her readers to suspend their disbelief. The Fiery Cross was a disappointment, but I didn’t stop reading it and actually looked forward to reading some of it each day, even though I did do a good bit of grumbling about how slow its plot was, how much I missed the earlier novels’ closer focus on Claire, and how much I wanted to learn more about how time travel works in Gabaldon’s universe. The next novel in the series will remedy these problems… right? This entry was posted in Authors, Diana Gabaldon, Fiction - general, Fiction - Historical, Reviews by Bethany, TIME TRAVEL. Bookmark the permalink. Dougal is Jamie’s uncle. Both Dougal and Colum are younger brothers to Jamie’s mother. I read the first 4 books in under a week each. This one dragged and was so uninteresting. Im so glaf others felt the same way. After 6 weeks, i took it back to the library. I didn’t finish it. I guess I should. Cant stand Brianna and Roger’s characters. Wishy washy. I agree completely. The series really went downhill (though there are still some bright moments) when she started telling the story through so many different points of view. Gabaldon is really good at writing that one voice and not much else. However, writing this blog has taught me that she has some VERY loyal fans who think her every word is scripture! Hi Lenuta; thanks for your response. I do think I’m a fan, if only I the sense that I’ve kept reading all the way through the books. When she writes in Claire’s voice, Gabaldon is a fantastic storyteller. But as a writer myself I can’t respect her approach, which is to publish her first drafts as is and accept no editing. I also find her lack of humility very off-putting on a personal level. Her books (I’m talking mostly about her later ones) would be so much better if she were willing to pare and shape them as the vast majority of other fiction writers do. But I always keep reading, hoping that the next Voyager or A Breath of Snow and Ashes will appear any minute. I didn’t know either until I went to hear her talk about her books. She was totally dismissive of the idea of editors and implied that writers who “let” their work be edited are “not professional.” I would say it’s the other way around. I still enjoy the story she tells about Claire and Jamie and will keep on reading, but I lost some of my respect for her after that. Thanks for reading and commenting! Oh, I also can’t believe that somebody has the same feelings as I do. I’m almost at finishig reading the fifth part but still wait for something to happen. It really doesn’t happen anything in this book. I “swallowed” the frst 4 books, especially “The Voyager”, even cried in some moments. There really was the development ang the sequence of actions. Damn, it was interesting and fascinating. The fifth book is a big dissapointment and I’m sorry to say that but I don’t think that I’ll read the remained ones. You know, sometimes it’s better to stop where it is but Diana continues inventing some nonsense plot and it ruins everything. I’ve found out that she is in process of writing the 9th book – don’t remember the title. What for?? The main characters were authentic, self-sufficient in the first book – why putting them in some endless torture for readers? And I also agree about Bri and Roger. If they weren’t present in the novel it wouldn’t change much. They are blur background for Clairr and Jamie. Bri-Jamie storyline is interesting, but Bri-Roger… It seems like Gabaldon wanted to repeat some moments with Jamie and Claire but I think she failed. I agree – Voyager is amazing, and A Breath of Snow and Ashes really is too if you’re willing to give the series another shot. But she is soooo inconsistent! Thanks for reading our blog and for your comment! I agree completely. Ever since they arrived in America, the series has become somewhat aimless- It´s just an endless series of events and while these events can be interesting and compelling, you just have no idea where it´s going. I also agree very much with your characterisation of Brianna, she is intelligent and determined, her storyline fails to be as compelling as that of Claire and Jamie because you believe in them, but not in Bree and Roger´s storyline. That said, I quite enjoy Jamie´s POV because I do consider it a Jamie and Claire´s story. BTW it is quite strange that she doesn´t allow editing. It is usually neccessary. She does seem to lack humility a bit and it does come across even in some interviews. I agree with absolutely everything you said in this post. I will finish this book even if it takes me the rest of 2018, because I’m no quitter (unlike some people who commented on this post). But after 6 weeks of reading the same book and having only gotten 47% of the way through, I’m getting a bit irritated with the process. But then 2018 has been full of disappointments, so why not add The Fiery Cross to the list? Hell, The Fiery Cross could even end up being a high point of 2018. The way things are going it could be. Oh I too found this book a real trial to get through! God knows how they are going to transform it into an entire season for the tv show Outlander – it could all be wrapped up in three episodes!